We’re sticking firmly with the one distillery this week as Becky Paskin explores six bottlings from BenRiach. 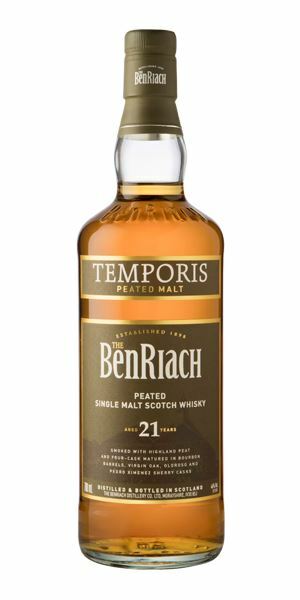 First up is the new 21-year-old BenRiach Temporis, a vatting of whiskies matured in four different cask types – ex-Bourbon, virgin oak, Pedro Ximénez and oloroso Sherry. It’s a soft, perfumed and Christmassy expression that reminds Paskin of hiking through the Blue Mountains. The following five bottlings have been selected from the Speyside distillery’s annual single cask programme. Now on its 15th batch, the range offers a glimpse at how this inherently fruity – and sometimes peated – spirit behaves in a variety of cask types – in this case a Port, Marsala and Muscatel hogshead, Port pipe and Sauternes barrique, aged for between 10 and 25 years. Just delicately peaty, with a touch of perfume, damp earth and hedgerow fruits. It’s not overt in any sense. There’s a degree of timidity, that something decadently fruity lurks behind the soft licks of peat smoke. Water releases poached pear and some intriguing wood spice notes. Things begin rather spicy and smoky, but hold it on the tongue for a short while as charred red fruits, cloves and cinnamon start to emerge. A double-dessert treat of black treacle tart and Sherry-soaked Christmas pudding, with an undercurrent of roasted chestnuts and hazelnut. A eucalyptus, star anise note runs through. Fruity, nutty and long. You’ll be tasting Christmas pudding for hours. 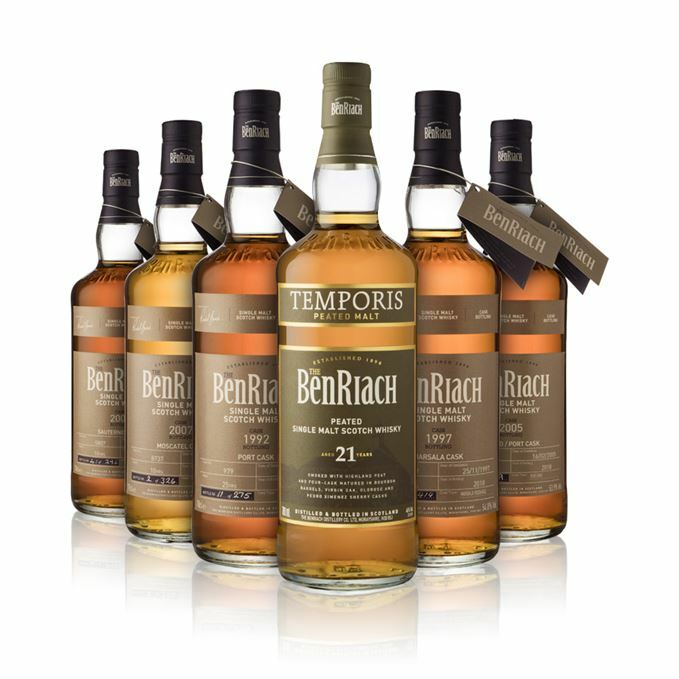 A softer side to peated BenRiach, which plays up the spirit’s signature fruitiness with a medley of cask types. Hiking through Sydney’s Blue Mountains, Sia dances out from behind a eucalyptus tree for a Cheap Thrill. The wine influence is immediately clear (it’s matured fully in a Sauternes barrique) in plump white grapes, an oaked Chardonnay, or sweet dessert wine. Vibrant white fruit – gooseberries, tannic grape skin, greengages, doused in a heady vanilla custard. It’s enchanting. Dry at first, and stunted. You start to believe that’s your lot when a pop of vibrant fruit and spicy oak creep up and perform a sneak attack. There’s some heat, which intensifies the clean white fruit – apricots, gooseberries– and citrussy lemon zest, before bizarrely subsiding into a Szechuan pepper zing and creamy vanilla oakiness. What a ride! Surprisingly soft. A faint memory of what came before. If anyone knows what it’s like to be a creep, it’s Radiohead. Sweet pâtisserie and floral tones jostle for attention. First toasted vanilla crumble topping, then rose essence. Next a berry strudel, fighting against jasmine and cut grass. It’s confusing. Given time to settle in the glass, the sweetness develops into rich crème brûlée, French toast and dark chocolate, while the fruit opens up with confectionery tones – strawberry laces, strawberries and cream Campina. All the while there’s an unshakeable copper tinge. Much more assured, the palate is rich with dark toffee, muscovado sugar, dark chocolate and red berry jelly sweets, peppered with baking spices that dance across the tongue. It’s surprisingly easy to drink considering the strength, with a lovely viscosity. Now into the burnt edges of a bread-and-butter pudding, with Bourbon-soaked raisins and sticky toffee pudding, yet despite the rich puds it remains attractively dry, almost leathery. Any hint of a floral nature has subsided. Dark and moody. Dark chocolate melting into a leather couch. Rich and indulgent, a result of full maturation in a Muscatel hogshead, but I’d like to see more cohesion given another few years in cask. The fragrance of love can tear a man apart… The trace of her Perfume is all I got. Things start intensely ashy, but soon relax into jammy sweet treats – fig rolls, damson jam and stewed rhubarb with Bramley apples. The sooty smokiness lingers on. Water intensifies the smoke, but now things resemble a water-bogged ashtray. A bitter beginning, all smoke and heat with a metallic dryness. It’s spicy all the way through, a chilli heat which intensifies over time. Water softens the effect, and while the fruits are now timidly apparent, they’re sulphurous and bitter. Peated BenRiachs certainly aren’t shy, but perhaps this one needs a little longer in its Port pipe for that heat and smoke to chill out. Collecting the ashtrays and empty glasses at Closing Time. Red fruit confectionery – cherry drops, black and green fruit pastilles, and lime zest. Water brings out a more citrussy and grassy quality, livening things up a bit. 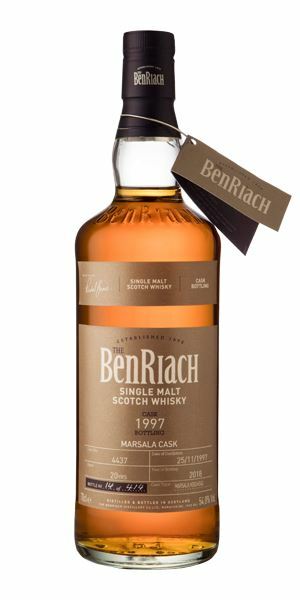 Fruits of the forest and sour cherry – the Marsala hogshead has really dialled up BenRiach’s fruity side. An abundance of zingy wood spice and overdone shortcrust pastry dominates the mid-palate. The experience is reminiscent of a Demerara rum. Water adds a vanilla-imbued creaminess. Rich, round and fruity, but a little one-dimensional. Sade rocks the joint. Sweet as Cherry Pie. At first it’s quite closed; aside from a waft of pencil shavings and leather, it’s difficult to coax out. Then, almost suddenly, there’s ripe blackberries, raspberry sauce and floor wax. Orange peel now, and cloves. Thick and honeyed. It’s deep: dark morello cherries, prunes, muscovado sugar, an old tawny Port and recently polished oak furniture. Meanwhile lighter, citrussy notes of orange peel and pith mingle with clove and cinnamon spice. It’s never too heavy though – those lighter citrus elements keep it afloat. It holds water well. Shined leather shoes and a good length. Sturdy; a well-aged BenRiach from a Port hogshead. Returning to your old school desk after 25 years. Oh, hey Britney!